New figures from the World Gold Council show that the annual demand for gold was up by 4.26% in 2018, with 4,345.1 tonnes of the precious metal sold across global markets. This is 185.2 tonnes more than in 2017 and brings gold demand back in line with the five-year average of 4,347.5 tonnes. 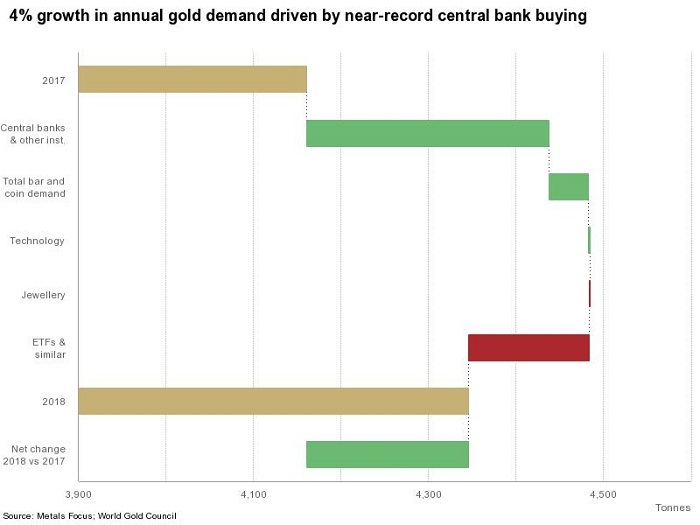 Demand has been benefited by the highest amount of central bank buying in 50 years. National reserves bought 651.5 tonnes of gold last year, with Russia the largest buyer in the world. Turkey, Kazakhstan, India and China (mainland) also made up the top five, with strong sentiment in these countries that gold bullion is the most sensible way to counteract the US Dollar after a bumper year for the greenback in 2018. China’s gold demand stayed roughly even with 2017 at 304.2 tonnes, while India’s Rupee struggled against the US Dollar for value, causing a 4% drop in gold demand. South-East Asia showed strong demand with growth of 10% in Indonesia, 9% in Vietnam, and 7% in Thailand, but it was the Middle East that shone in 2018. Demand for gold doubled from 43.2 tonnes in 2017 to 87.1 tonnes in 2018, with Iran the main buyer. Iran is currently subject to strict sanctions imposed by the US and its main trading partners, and the Gulf state is seeking to diversify its reserve holdings to help avoid such levels of American influence over their economy. An area of particular interest for BullionByPost readers is the European figures, which showed an 11% decrease in demand compared to 2017. In contrast, UK demand was up in the face of Brexit uncertainty, with a 12% increase in demand year-on-year, equivalent to 11.6 tonnes. The total supply for gold was up slightly for the year at 4,490 tonnes, with mine production once again beginning to expand in Africa and South America following years of subdued output. Gold recycling is also growing in popularity and efficiency, with Turkey and Iran the chief proponents of such work. The price of silver rose by 9.1% in December, which was its biggest gain for a month since early 2017, and silver is currently sat at a six-month high of $16.10 per ounce. Some experts are predicting that the precious metal, which has been stuck in a bear market since 2012, will now enjoy a steady rise in value throughout 2019 as supply begins to shrink and meets demand much faster. Gold mining projects have started to spring up once again as gold hits near-record prices across the globe, but silver’s low price has deterred many mining companies from embarking on new projects, and even seen silver mines close down until prices rise once again. Société Générale, the French financial firm who declared last year that silver was far better value for money than gold, estimates that 26,000 tonnes of silver will be refined in 2019. This would be the lowest figure since 2013 and would make silver’s decline in supply the largest of any precious metal, though it wouldn’t yet match the level of supply deficit that palladium is experiencing. A short survey from Bloomberg of 11 traders and analysts believes that silver could rise from its current price up to $17.50 per ounce – the highest since early January 2018.